I have been very busy painting and exploring options for shading, blushing and more. 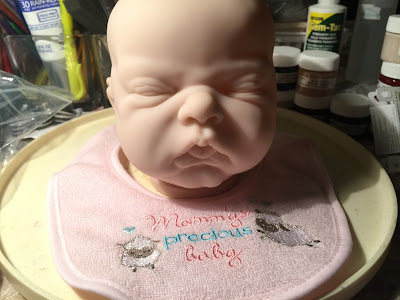 I have spent over 6 hours trying to get the lips right on my first reborn baby doll. 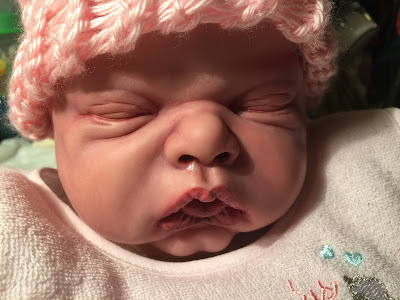 Lots of attempts to get the lips similar to some other artists's reborn lips that I admire. It has been a bit frustrating and I have redone them several times. I am not sure if I am even happy with them now. I wish I could find a good tutorial on lips that has a result I like. Perhaps it's just the difficulty of the baby I chose to paint. Her mouth is open, tongue out slightly, and her lips are pursed creating a weird set of lips. I also noticed they are not symmetrical so that too posed an issue for my first baby. Nose looked a bit wet but I cleaned that up. I tried to make her look as real as I could, giving her lots of shading, blushing and a newborn color scheme. So far I think she has been baked at least 12 or more times. Wow. She is about to get her final matting layer before I start putting her hair in. I have ordered her neck and arm/leg rings and I am ready to hurry up and get this girl together so I can give her a cuddle myself! I can't wait to dress her all up! Well compared to her starting look what do you all think? I think she has a very real look. Celeste is halfway finished. I still need to root her eyelashes and hair. Not sure what you are thinking, but my kids all say it's creepy because she looks so real, lol. I have redone her over and over with layers of Genesis Heat Set paint. She is really looking pretty life-like. I'm missing a few of her pieces so I had to order her plugs and neck ring today. Hoping it will be here by Monday. I am planning on starting to root her hair this weekend. She will have light brown hair and light brown eyelashes. I need to bake her and then paint some more gloss on her lips and other details. Celeste Natalia will have light brown hair, lashes and eyebrows. 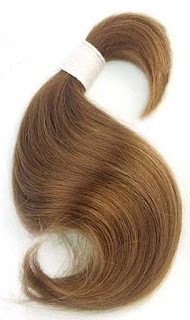 I hope to create a soft newborn fluff of hair that can be brushed up into a curl or brushed into various baby styles. I will keep you aprised of the hair situation but I can't do it while toddlers are crawling all over me and demanding things. Two pairs of Pabol eyes I ordered have arrived. They are really beautiful and much tinier than I could imagine! 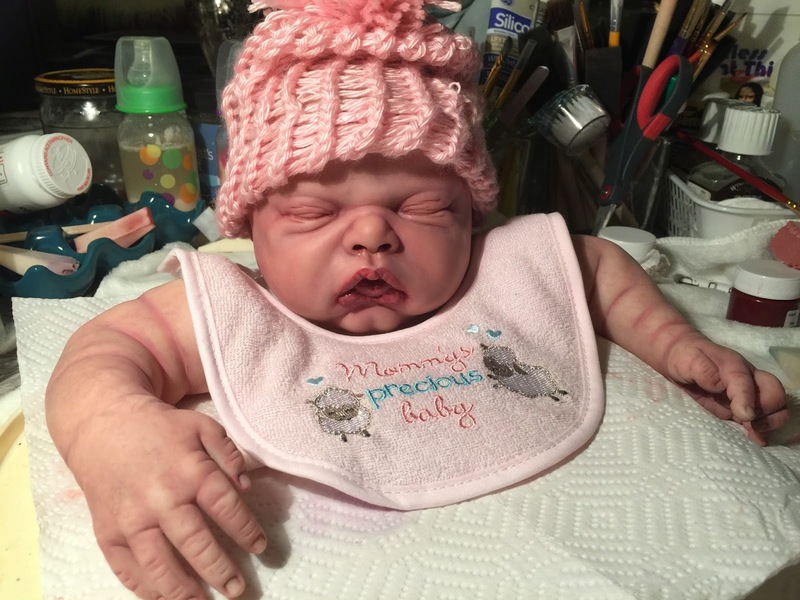 I can't wait to try them in my next Reborn baby. The Pabol eyes are so nice and lifelike. I am thinking of ordering more. I am considering selling the Pabol Eyes if you all are interested let me know. They are so affordable compared to some other eyes. I have been caring for two toddlers today (my grand babies) and I am pooped. Plus my daughter's car has a cracked head gasket so I am sure we will be spending countless hours at a Car Dealership tomorrow trying to get her a new car.